Many years ago, a father took his children to the seashore. It was a perfect day. The sky was brilliant blue and the sun was warm and inviting. The lovely smell of salt air was invigorating. Light fluffy clouds provided occasional shade. There was a light sea breeze that cooled the skin and refreshed the soul. The father had provided everything that was needed to make the visit comfortable and enjoyable. He had brought large beach umbrellas and ample blankets to sit on. The ice chest was full of sandwiches and snacks, as well as a variety of cold refreshing drinks. The car was loaded down with boards, balls, floats and other recreational equipment. They were well prepared for an exciting and pleasant stay. Just before releasing the children to pursue their adventures, the father gave them one constraint. “Don’t go out into the water past chest high.” There were dangerous currents out there. At that the children went running into the water screaming and laughing. They played in the surf, splashing and jumping. It wasn’t long though before the two oldest siblings, a brother and sister began to think about how much fun it would be to go out a little deeper and ride the waves into shore. The father looked out to inventory the children and could not see the two oldest. He immediately went in after them and was able to retrieve them to the shore. It was apparent that the children couldn’t be trusted to obey his instructions. It would be necessary to impose further restriction on them to ensure their safety. He limited their play to the shore for the rest of the day. While they could no longer play in the surf, there were still many activities they could enjoy and after all, it was a beautiful day. The children considered the possible options and eventually decided to build sand castles. They gathered all the buckets and shovels they could find and set to work building one tall tower but it collapsed under the stress of the drying sun and wind. They then broke into groups and began separate construction projects. The activities soon became a competition to see which team could out due the other. As the talents of one group became apparent, the other teams began to try to sabotage their structure. One group tried throwing sand bombs at the castle. Another sent an assailant to kick down the wall while the defenders were dealing with the bombs. The disharmony quickly spread within the teams causing individuals to start their own projects. The competition as well as the jealousy grew as the afternoon continued. Some of the children were swollen with pride at the size and detail of their creations. They compared what they had accomplished to their siblings’ structures and taunted them for their lack of ability. Some reacted by trying to align themselves with the perceived champions and helped them denigrate those found lacking. Eventually, the interactions degraded to pushing and shoving. Suddenly, the children became quiet one by one as they watched the rising tide envelope their creations in order. As the water reached each individual kingdom, the details applied with so much effort began to dissolve. Then the structures began to crumble and finally the sand itself was dragged out into the ocean. When the last of their efforts was washed out to sea, they realized that all the work they had expended, the source of so much pride, jealousy and discord was in reality nothing more than piles of dirt. The only thing left was the relationships forged during the day. The special day that their father provided had past nearly without notice and certainly without the enjoyment intended. Our Heavenly Father placed us in a beautiful place and provided everything we would need to enjoy it with our brothers and sisters. We have reacted with disobedience and discord. Busying our lives with building our own kingdoms from the dirt. 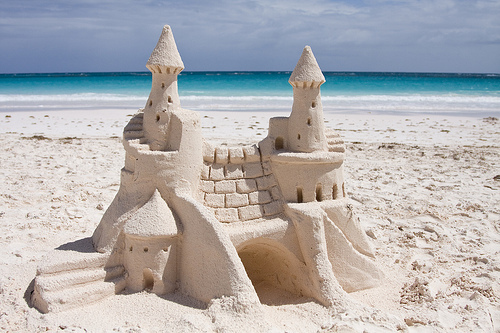 We compare our dirt castles to those of others and are puffed up with pride when we think our efforts rival others. In the end, the waves of death reveal the true substance of our work. Our lives pass and we miss the enjoyment of the relationships our Father intended.